We had so much fun designing our cutesy Valetine's Day tags earlier this year (wow, February feels like such a distant memory) that we thought we just had to share some Christmas tags with you too! We decided to design these labels with the kraft trend in mind as it is so popular right now (type in "kraft Christmas wrapping" in Pinterest and you'll see what we mean). We've designed 6 different tags with messaging in a scheme of kraft, white and red. 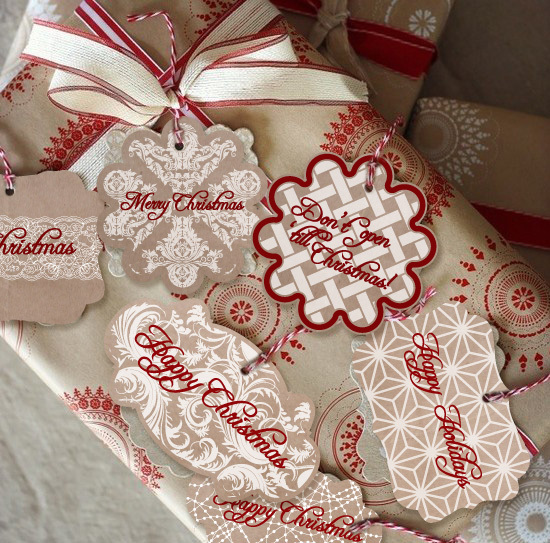 There is so much you can do with these tags - tie them onto kraft wrapped packaging and use pretty lace and red ribbon to complete the gift. We also love the idea of attaching small candy canes or mini baubles to the gifts to make them extra special. These could also be cut out and stuck onto kraft cardboard to make a simple Christmas card. The possibilities are endless, so get creative and download the tags here. You'll find instructions on how to use them on the downloaded sheet.